Tha an teaghlach a tha a' reic an eilein Tannara Mòr, far Aichilidh Bhuidhe, a' dèanamh iomairt às ùr gus a reic. 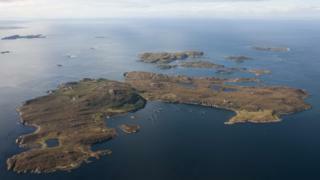 Tha an t-eilean, sa bheil mu 800 acaire (323.7 hectaire) air a bhith air a' mhargaidh bho 2013, agus cha-mhòr £2m ga iarraidh air. Chan eil duine an-diugh a' fuireach san eilean, ged a bha bho chionn ghoirid. Cheannaich an teaghlach Wilder an t-eilean ann an 1996. Tha iad a-nise air innse gu bheil iad ga reic ann an trì earrainnean - ged a tha iad fhathast deònach gabhail ri tairgse airson an eilein air fad. Tha oifis puist air an eilean, far am faod luchd-turais stampaichean a cheannach gus stuth a chur air falbh gu Tìr Mòr - agus stampa a' Phuist Rìoghail airson a' chòrr den turas. 'S e an aon eilean an Alba a tha a' ruith seirbheis phuist phrìobhaidich fad na bliadhna. Anns an Dàrna Cogadh, bha an t-eòlaiche àiteachais agus glèidhteachais Frank Fraser Darling a' fuireach ann an Tannara Mòr, agus leasaich e pìos mòr de thalamh an eilein, ga dhèanamh torrach le bhith a' cleachdadh todhair agus gainmhich shligeach. Mus deach an t-eilean a chur air a' mhargaidh, chaidh bruidhinn ri muinntir Aichilidh Bhuidhe air Tìr Mòr, feuch an robh iadsan airson a cheannach, ach air a' cheann thall cho-dhùin iad gun sin a dhèanamh.